It was like I had a tunnel vision, lost in a world that was only in front of my eyes. I was existing in my own self-fulfilling world – my career, that perfect house and the car – because it was what 'I was supposed to do'. I had a great job, a future promotion opportunity, and a mortgage. At work, we were busy making our ‘numbers’ every year to achieve our profit targets. I was oblivious to even what conscious living was, and I knew deep down, this wasn’t life or career fulfilment at all but I continued with it because it was what I was "supposed to do". I was lost in doing and ambivalent to observing. It took years to realize I was unconscious. Anything else in my life was beyond my peripheral vision, and it didn’t warrant any conscious awareness. Even when I spent time with friends, I was physically there, but my mind was somewhere else. Usually, I was thinking about Monday morning at the office or that next meeting where I had to present to my boss. Of course, my husband and I maintained a household, completed home projects on the weekend, stared at the TV every night after work with a bottle of wine to escape, and we did things like Saturday morning grocery routines because those hit my important "to-do-lists". Sadly, there were days when I arrived at the office without any idea how I got there. My mind didn't even register getting into my car, and driving to another location! I was lost in this mind-space continuum, dictated by my work that, again, demanded most of my attention. Had I lost that much control of my life when can’t even recall arriving at a destination? Social media was a big culprit of my unconscious state, often. It was a distraction from my work, although I justified it as work – to connect, to check in, or to share my productive career-life with others. I remember sitting in the waiting room of my doctor’s office once and I didn’t even hear my name being called numerous times. I had been waiting there over an hour, engrossed in a vortex on Facebook. These are examples of how I spent my time unconscious. A life voice of conscious living can manifest in different ways, too. Have you experienced any of these scenarios where you had no conscious awareness? Buying something because someone told you that it was good for you, instead of making up your own opinion or doing your own research. Buying a house because of what society told you to do, once you had a good job. Grocery shopping at the end of a long day and just buying whatever was interesting or piqued your interest at that time. ​​​​​It’s really no wonder why I felt unfulfilled, lost, and self-absorbed. Fortunately, I’ve had the pleasure of entering my deprogramming mode for the last four years. This is the state in which I am gaining awareness and making deliberate, and more intentional actions. I learned through trial and error and through friends that have discovered the difference between conscious living and giving into an unconscious life. 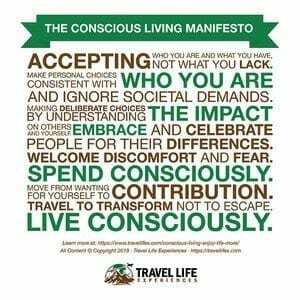 Thanks to our friends and their opinions, we developed a manifesto to live with a conscious mind. 1. Accepting who you are and what you have, not what you lack. Once you lose the self-absorbed worry and angst about what you don’t have, you’ll find the space in your mind to go after what you really want in life. You ARE in control of your life. You get to choose your own reality, how you react to struggles and setbacks, and which doors you open and which ones you close. You can do this best by being yourself, without a mask. Maybe you have had a lifetime of thinking you are not good enough. This is because people have pointed these things out to you. Sometimes, it’s intentional so that they can feel better about themselves. Often, they don't realize the impact of these comments. Maybe you were told: “You didn’t good enough grades”, “You aren’t smart enough”, “You aren’t tall enough” or “You aren’t athletic enough.” This is pure garbage. You are worthy, you are enough. You just need to convince yourself of this, not anyone else. You can strive to be whoever you want to be by changing your views of those stories, because they are just that stories, not reality, your reality. Enjoy the journey of discovering what's possible for you, and the things you once thought were shortcomings, can make you the unique person that you are. There is no right way to live your life. Although it is your life, and given you aren’t on this earth for a long time, you have 100% permission to make your own choices. It starts with being honest with yourself. You don’t need to accept what society places on the ‘right way’ because you are not living your life for someone else. There is no right way because we are individuals with different needs, desires and dreams. So, it is you who creates your own path. The cool thing is that you get to prioritize your time and who you want to spend it with because your time is precious. Think of those friends and family members who never had this opportunity to live out a full life, and they were taken from us too soon. This is your wakeup call to living a life of no regrets. You have permission to ask WHY a lot. ​-Why does this have to be done this way? -Why is that made this way? -Is there a better, more practical and sustainable way? -Why do I continue to do this when this doesn’t support my values? -Why am I doing this work if I don’t feel fulfilled and I hate it? -Why do I hang out these friends that don’t inspire me, challenge me or love me? Every WHY question is never a bad question and it gets you to decisions that support your values and your truth. The power to say no is yours. It is a hard thing to do, but with practice you can do it consistently. Say no to the small things first: say no to attending that event, say no to another piece of pie, say no when you don’t have the time to meet. This will help you work your way up to bigger NO’s in your life, and leave you room to say YES to things that allow you to change and grow. You choose your food that is good for your body and gives you energy. You choose to spend time with friends who are positive, encouraging and that care for you. This is so much more fulfilling than spending time with friends who are negative or unauthentic. You choose the entertainment you want to experience. Movies, books, games, or events that build on your creativity, let you learn a new skill, challenge you, and inspire you. These are entertainment not for escape but for fun and personal growth. Spend your energy on the things that matter. Let go of grudges, anger and resentment towards others. This is wasted energy, and robs your soul of time for things that really matter. Likewise, becoming obsessed with your goals, ambitions and dreams doesn’t leave room for you to enjoy life. Find a balance in relishing the journey to a conscious life. Maybe you didn’t get your way, or maybe someone or something disappointed you. You have 100% control over how you react to any situation. No one owns your reaction but you. And anger serves no purpose. How about spending your energy on reacting to things that bring you joy? Making choices based on your values is one thing. But making conscious choices is another. You become a keen observer of life, but your life isn’t just yours. It is only a piece of a greater world. How will this choice you make affect others? How will it impact the earth, nature, and the sustainability and future of others? How you speak to someone, can have a major impact. You need to realize and acknowledge this.Words can inspire, but they can also harm. The key is being consciously aware and to ask how your words affect them.Words also aren’t always necessary. Sometimes, silence is enough. It allows others to share their opinions and views, and leave a space which can often enhance your own thinking. There is power in a pause. Our earth is on the brink of a catastrophic change. Every plastic bag, every tap left running, or every second you turn your car’s engine affects our environment. Every bag of garbage doesn’t magically disappear once it is picked up from your house just because we can no longer see it. It is a shared responsibility for all of us to make choices that respect ourselves, our family, and our future survival. Small changes matter. One person (you) can influence changes in others. It is your choice not to use plastic or to reduce your use of products from companies that aren’t doing their part for the environment. You can set an example to support a world you want to live in. The world is more interesting, dynamic and interconnected because all humans have different strengths, opinions, skills, desires and dreams. We don’t have to like what everyone does or says, but you can respect it and respect that they have a voice to share it. When we live life consciously, we seek to understand other views and opinions. Being empathetic creates compassion and tolerance. We can rise above hate and racism by seeking to inspire and motivate others to choose how we can all live a better, happier and more fulfilling life.To do this, we need to listen to understand rather dominate conversations, form opinions quickly and judge without listening and being present and open-minded. 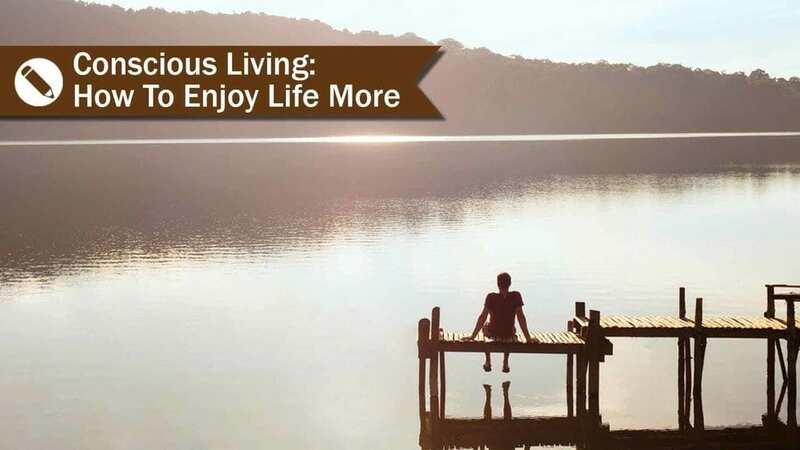 ​Living consciously is accepting that you want to evolve, and that you want to get the most out of life. Getting the most out of life means trying things that scare you. The funny thing is that once you try something scary, you will realize it wasn't what you imagined, in fact, its probably exhilarating! That one little push through your fear builds courage where you can start to believe anything is possible and leads to more opportunities. ​No one wants to put themselves into an uncomfortable situation. Discomfort is the result of a bad or difficult situation, however, discomfort creates personal growth. It shapes you into who you are because you had unpleasant experiences under your belt that will make you stronger to make conscious decisions bout how you live your life. Embrace discomfort because on the other side of it, there is growth, accomplishment and learning about yourself. Conscious spending is knowing the difference between a need and a want and being considerate about how best to spend your money. It is mindful spending such as going to shop with a plan to purchase, as opposed to boredom shopping for something to try to fill a void in your life for something that you don't currently have. (confidence, love, self-esteem, etc.) It is rationalizing with conscious decision making for every purchase and recognizing the value it brings to your life (or not). Will this item really be used, often? Will it have a lasting benefit to me, or just be tossed or donated when I am tired of it? 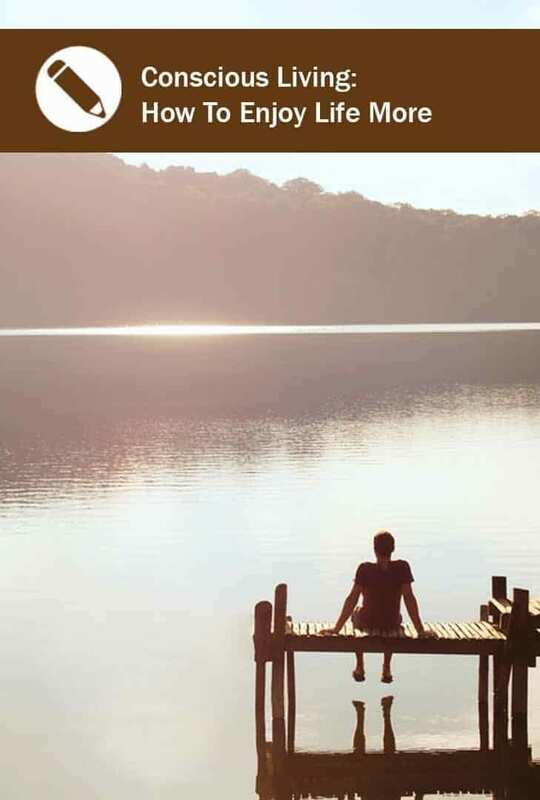 When you lead a conscious life, experiences place a higher priority in your life than things, and a larger proportion of your money is dedicated to enjoying life and creating memories instead of buying things. 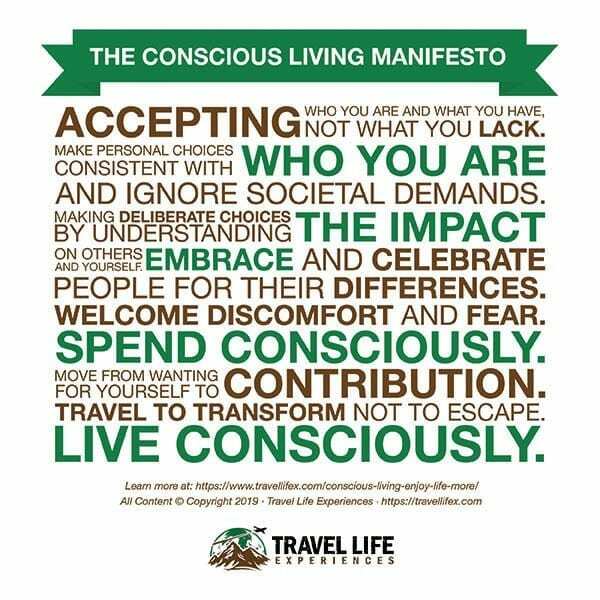 Travel is one of the greatest ways to create conscious transformation in your life. A conscious life moves your motivations from solely wanting something for yourself, to seek out opportunities to help and contribute to others. Helping others in need and sharing your skills and experience can be the most rewarding accomplishment because it gives you inner joy and satisfaction. Contribution is about servicing others. It is not about getting something in return or recognition. This higher service is about the joy that helping others brings you. Also, when your time is up and you leave this earth, you know you have helped others, donated to a cause, volunteered your time, or made a difference by the work and effort you put into something to help another person. Then, your life has meaning. Travel is the greatest accelerator for change in your life. There is nothing that can change your view of the world and yourself more than a meaningful travel experience. You learn, grow and transform by surrendering yourself to a new consciousness and awakened experience. When you are in a different country, in a different environment with different culture and people, this awakening spawns. The best part of travel is its ability to open up minds, change attitudes, and adjust perceptions and prejudices. Travel to transform. Moving to a Conscious Life isn't easy. The first part is awareness, and then it is being honest with yourself about what is happening, such as stopping yourself when your mind is drifting or you catch yourself saying or doing something not consistent with your truth. You will have moments in and out of consciousness because the world is very complicated. You are surrounded by negative energy, and energies can be counterintuitive to your values and your ability to make choices.You need an outlet to calm down your mind and maintain mindful thoughts and actions. Meditation and exercise are two of the best ways to change your focus, enable your breathing and clear your mind so you muster up the energy to make conscious changes to become a better version of yourself. 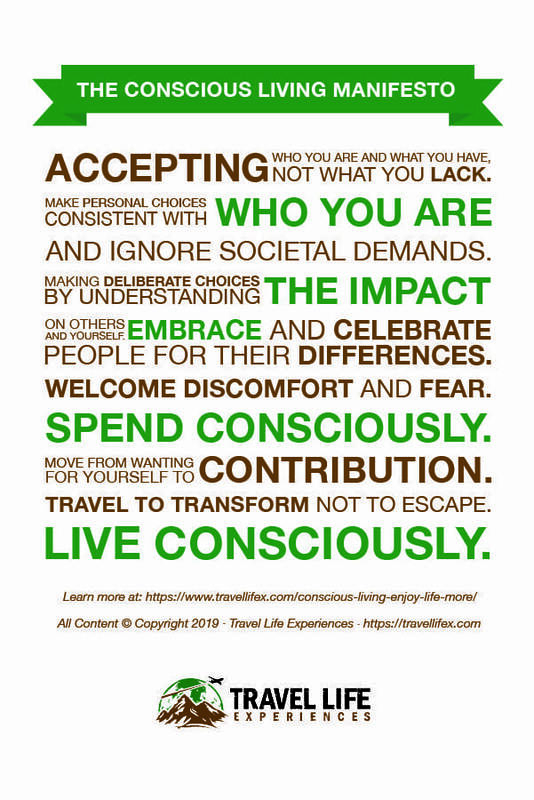 Can Anyone Transition to Conscious Living? However, you must start unconscious, so you can realize the difference and the benefits that being present, intentional and conscious will reward you. It is a constant journey to take meaningful, deliberate steps to live a life of purpose and meaning. How do you strive to enjoy conscious living? Please let us know in the comments section. Does this mantra resonate with you? We would love to know. Pin It and Read It Later!